The G180 Nozzle is built on a modified G457 chassis. 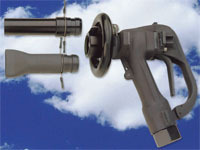 The G457 has been the preferred nozzle of many military organizations around the world for many years. Each nozzle is flow and leak tested at the factory and assigned a serial number. Serial number can be traced to test date and results achieved. Serial number and manufacture date are engraved on the nozzle. The valve design makes it easy to control flow. Allows the fueler to smoothly increase and decrease flow without line shock or recoil. Makes fueling process more efficient and less strenous for the fueler. 100-Mesh Stainless Steel Strainer - easily accessible for routine inspection.